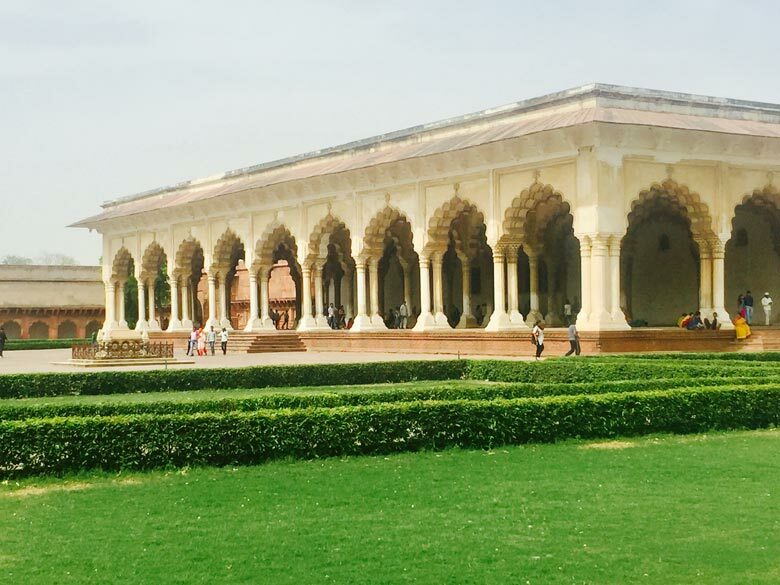 Who made the Agra Fort? – Breaking out of his ancestral home in Central Asia, Babur, the first of the great Mughal emperors, fought his way into India and seized Agra, then the capital of the Lodi kings. Here it was that he and the first four of his successors created the famous buildings which yearly attract thousands of visitors from all over the world. Interest is naturally focussed on the Taj Mahal, the most celebrated of them all. However, those interested in Mughal artistic expression, architectural styles and the use of materials may find that the most rewarding sequence starts with Akbar’s fort and his temporary capital of Fatehpur Sikri. Akbar’s tomb at Sikandara is an unusual digression from a development leading to a high point of Indo-Persian architecture represented by the Agra fort’s marble palaces and culminating in the Taj. Akbar, arguably the greatest of the Mughal emperors and one of the outstanding rulers of his time, started construction of the majestic red sandstone fort in Agra in 1565 when he was just 23 years old. His grandfather Babur had been too busy fighting off threats to his newly established regime, and his father Humayun too harassed by his misadventures to undertake anything so ambitious. Besides, there was a fort in Agra already, built by a medieval Rajput dynasty, and given the evocative name of Badalgarh. 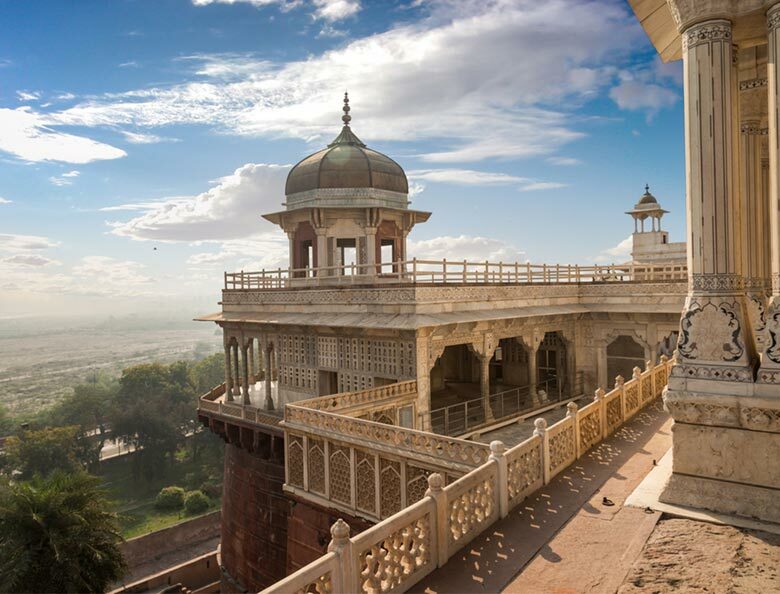 Its turrets may not have mingled with the clouds, as the name suggests, but it was occupied by the Lodi Sultans of Delhi in AD 1504 when they made Agra their capital. Babur did not need to make major improvements in Badalgarh after he captured the city in 1526. The old fort became the setting for lavish court d ceremonies in the Central Asian style. The miniatures of the Babur Mama, though painted fifty years later in Akbar’s reign, depict richly bedecked awnings and terraces laid thick with colourful carpets from his homeland Both Babur and his daughter Gulbadar Begum, in their memoirs, have left vivid descriptions of court scenes with visitors from Persia and Central Asia, and Mughal dignitaries being entertained by dance, music and other diversions. Badalgarh adequately served its original purpose as fortress, stately court for the ruler and guardian of the royal treasures. But it was not enough for Akbar: according to his biographer Abul Fazl, he gave instructions in 1565 “for the building in Agra — which by its position is the centre of Hindustan — of a grand fortress such as might be worthy thereof, and correspond to the dignity of his dominions”. Three years earlier, when he was just 20, Akbar had launched on a whirlwind career of conquest which confirmed his supremacy over the whole of northern India. Young as he was, he realised that military might alone would not win him the hearts of his people. He therefore set himself the more difficult task of breaking with the long-established tradition of Muslim rule to create an atmosphere of reconciliation. Discriminatory taxes against Hindus were abolished, and he contracted marriage alliances with princesses of the leading Rajput royal houses, conferring military ranks on distinguished Rajput commanders. These measures paid off handsomely. Except for Mewar, most of the leading Rajput families became closely associated with Akbar’s regime and served him with exemplary loyalty. The Agra fort itself and the varied buildings within its walls were the earliest embodiment of the syncretic spirit of Akbar’s reign. To start with, the Hindu Raja of the neighbouring state of Karaoli was pressed into taking part in the foundation-laying ceremony, in deference to the prevailing belief that this would ensure the protection of the fort from erosion by the river. There has been no damage on this account in all these 450 years. 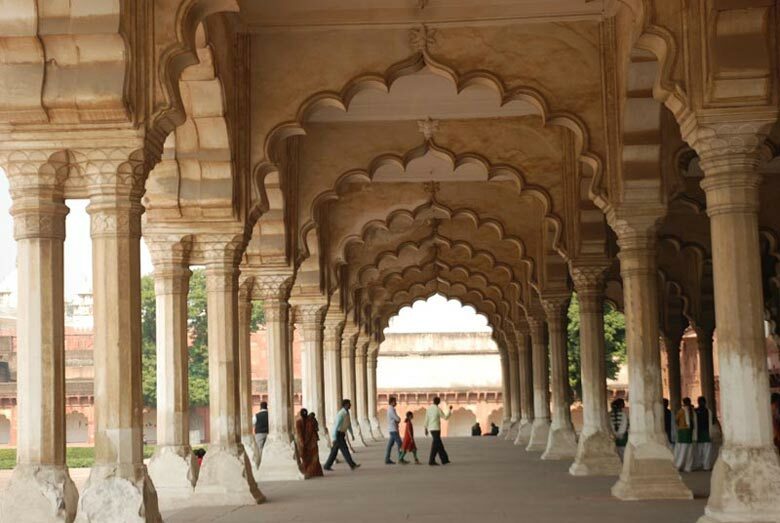 Agra fort was Akbar’s first great architectural venture in North India, and he went about it with characteristic vigour. Within eight years, three or four thousand labourers working day and night completed the massive walls and imposing gates, as well as most of the buildings inside — according to Abul Fazl, as many as 500 — made of sandstone “in the fine styles of Bengal and Gujarat”. Akbar’s Rajput queen of the house of Amber (Jaipur) was able to occupy her palace, Bengali Mahal, only four years after work started. 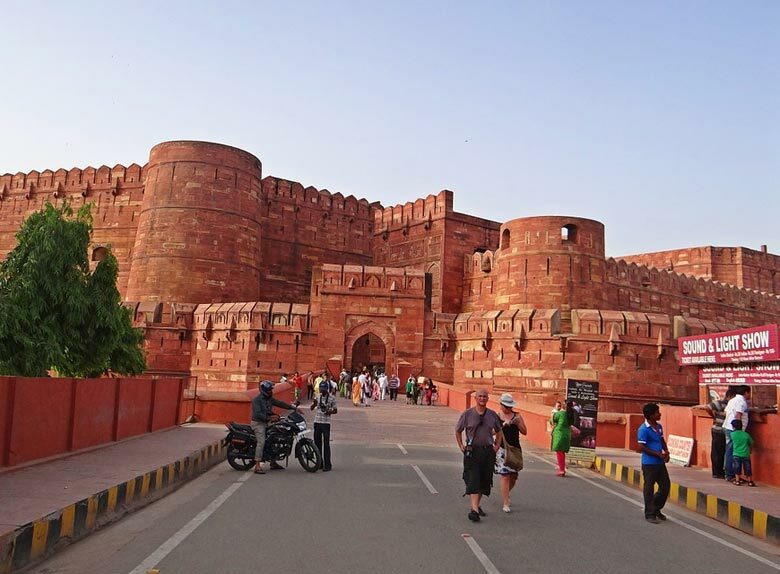 Agra fort’s walls have survived precisely as Akbar built them, but since his successors demolished most of the buildings inside to make room for others of their own choice, it would be convenient to consider the two separately. The first impression of the towering walls is one of majesty. The precision with which the red sandstone slabs are laid bears out Abul Fazl’s picturesque claim that they “were so joined together that the end of a hair could not find a place between them”. Monserrat, a Jesuit priest who spent two years at Akbar’s court, was no less enthusiastic: “The stones of these buildings are so cunningly fitted that the joints are scarcely visible, although no lime was used to fix them together. The colour of the stone, which is all red, also produces the same effect of uniform solidity.” The walls are about 21 m (70 ft) high at the highest points, but the width at the base cannot be accurately determined because they are embedded in masonry and filling. The perimeter is about 2.4 km long. The layout of the Agra Fort Agra was determined by the course of the river, which in those days flowed alongside. The main axis is parallel to the river and about 823 m (900 yards) long. The walls bulge out towards the city, suggesting to William Finch, who visited Agra during the reign of Akbar’s son, Jahangir, that the entire complex “lyeth in manner of a half-moon, bellying to the landward”. The prosaic traders in London, to whom the report was addressed, might have wondered whether their agent was becoming carried away. When Finch was in Agra, the broad expanse of the river Yamuna had not been diminished by the canals which have since drained away its Himalayan waters for the development of the parched northern plain. Flowing along-side the eastern wall, it formed an integral defensive feature, also creating an environment of relaxation and enjoyment for the imperial court. Controversy still surrounds the fate of the old Rajput fort of Badalgarh. An immense structure which had survived 400 years of buffeting by a stormy history and harsh weather could not have disappeared into the ground. Abul FazI gives a revealing clue. “An inevitable mandate was issued that the old fort should be removed, and in that place should be founded an impregnable palace”. In 1871, General Cunningham, who was Director General of the Archaeological Survey of India, came to the conclusion that the old Pathan fort occupied exactly the same position as that of Akbar, with the the exception perhaps of some of the gateway outworks. The “Pathan fort” was of course Badalgarh, which the Pathan (Afghan) Lochs had taken over. 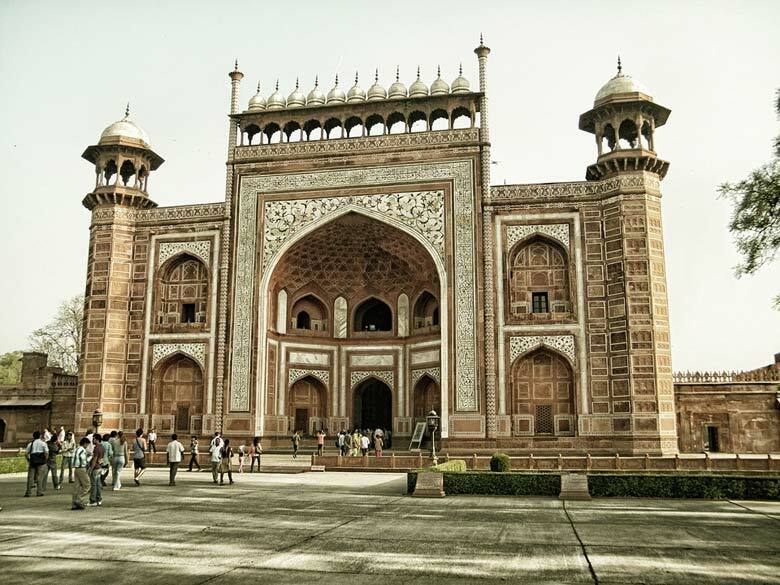 Akbar’s fulsome biographer, Abul Fazl, tells us with characteristic hyperbole that the walls were “provided with four gates whereby the doors of the dominion were opened to the four quarters of the world”. Of these only two remain open. The main entrance, now calledAmar Singh Gate, originally was given the more appropriate name of Akbari Gate. Hathi Pol or Elephant Gate, to the northwest, led towards the city. It was here that the people of the realm gathered for business, for it was the seat of the Qazi (judge under the traditional law), and of the Vazir (revenue minister). According to Finch he sat there every morning for three hours, to deal with “all matters of rents, grants, lands, firmans, debts etc.”. The northern gate of Agra Fort led to what might be called the store of ordinance, while the fourth gate, facing east, overlooked the river. This was called Darshani Gate, from which the emperor gave audience to the general public who did not have access to the court itself. The gate, says Finch, led “into a faire court extending alongst the river, in which the king looks forth every morning at sun-rising which he salutes, and then his nobles resort to their tessilam (deep salaam)”. This ritual became so formalised that many would neither eat nor wash before appearing in the ruler’s presence. The Darshani Gate had another purpose. Akbar used it to view elephant fights, and in his younger days he would dash out and mount the most ferocious beast. His son Jahangir surrendered to the pleasure of watching animal fights of all kinds. Once a week, Finch has it, “is a day of blood, both of fighting beasts and justiced men, the king judging and seeing execution”. Little is left of the architectural and decorative styles which evolved in this most formative and and culturally effervescent of periods. The buildings inside the walls underwent so many changes in the two succeeding reigns that it became a veritable display of all the styles of decoration developed under the Mughals. These spanned Akbar’s synthesis of Hindu and Muslim traditions, the poetic interlude of Jahangir in which the emphasis shifted to the pictorial arts, and the eventual efflorescence of Indo-Persian forms and decorative arts favoured by Shahjahan. Nothing remains of the 500 or so buildings completed under Akbar, except the Jahangiri Mahal facing the end of the ramp from the main gate. Only a few ruins tell the tale of Akbar’s own palace, overlooking the river, and the Bengali Mahal embodies a pleasing synthesis of the Akbari period with a few marble touches added by his son. The interiors are believed to have been inspired by the Man Mandir palace in Gwalior, and probably also executed by artisans from there. Their chiselled sandstone work was excelled only in the pavilion facing Anup Talao at Fatehpur Sikrii. Floral designs alternate with arabesques with a fluency found only in the finest wood carvings. From Amar Singh Gate, a ramp leads straight to the Chihl Satun, a pavilion of forty beautifully proportioned pillars, with a satin finish of lime, eggshell and resin. This is the Diwan-i-Am, or hall of public audience, overlooked by the jarokha, or window throne, from which the emperor gave audience. 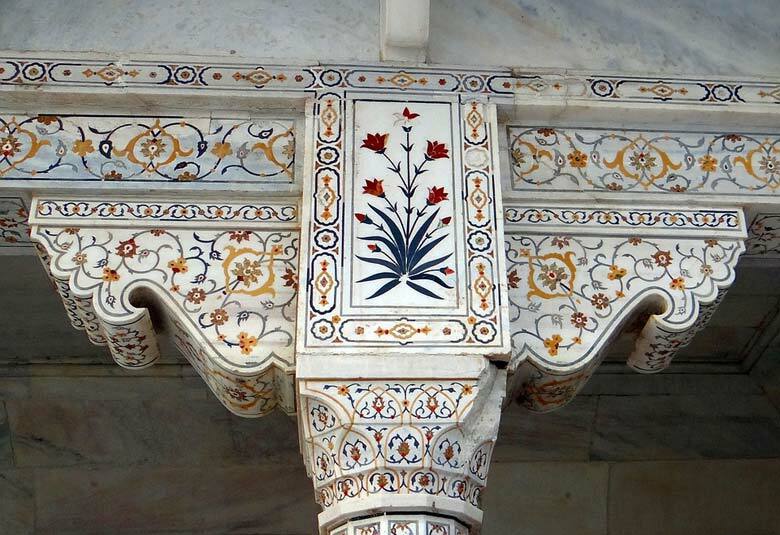 Here the visitor gets a foretaste of the marble and semi-precious stone inlays lavished by Shahjahan on the space between the jarokha and battlements overlooking the river. An explanation of Shahjahan’s ambition to outdo his ancestors was given by Mulla Abdul Hamid Lahori in his Badshah Nama: “In this everlasting reign the demand for arts has a different market and the Divine care has adopted a new method of embellishing the world; at the place of the old have been built sky-touching mansions of marble”. It was indeed a taste altogether different to Akbar’s eclectic preference for prevailing Indian styles brought to perfection by local craftspeople. “The erection of this delightful lofty palace Has exalted Akbarabad to the Arsh [ninth heaven]”, a claim which few visitors are likely to question. The verse provides confirmation that after his death Agra was regarded as Akbar’s city. A series of marble palaces and pavilions were built by Shahjahan behind the Diwan-i-Khas, each one excelling the other; but the prize, if it can be awarded, must go to the Daulatkhana-i-Khas, or royal residence. Its Tambi Khana or parlour is the gem in this imperial diadem. Projecting beyond the wall is the Jasmine Tower from which Shahjahan gazed at his greatest creation of all, the Taj Mahal, floating in the distance. 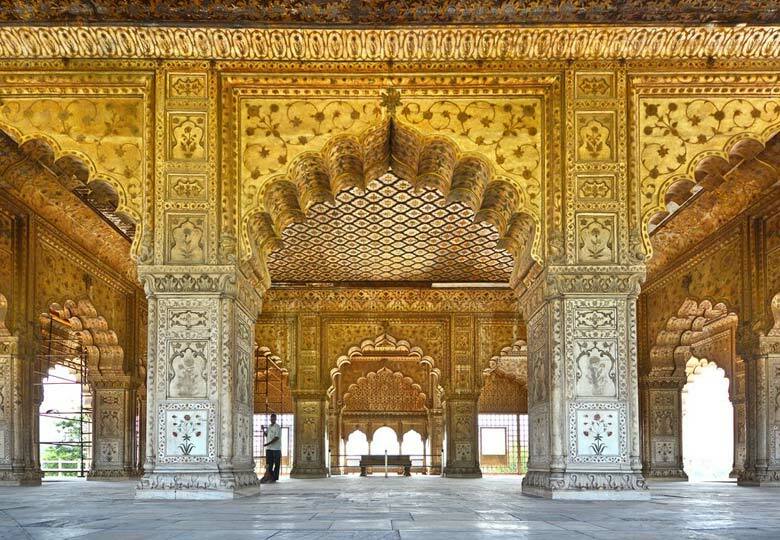 His daughter Jahanara occupied the Khas Mahal further on, with the recessed Anguri Bagh or Garden of Grapes providing colourful relief from the dazzling marble all around. The Hamam, or royal baths in Agra Fort, according to the contemporary historian Mulla Abdul Hamid Lahori, consisted of several buildings overlooking the river. This too was pillaged — by the British, who sent the most magnificent of the marble baths to the Prince Regent. The Hamam is now closed, but the visitor can visit the fairyland of the Shish Mahal, or palace of mirrors. Two mosques should not be missed. Aurangzeb built the Nagina Masjid next to Machi Bhawan for the women of the palace. Discreetly hidden away in an elevated courtyard of its own is Shahjahan’s Moti Masjid or Pearl Mosque. The name was conventionally given to a white marble place of prayer intended for the emperor, his family and chosen attendants. There are similar mosques in the forts at Delhi and Lahore, but the Moti Masjid in Agra excels them in scale and sheer purity of line. The women of the harem offered prayers in side rooms screened by marble lattices. The mosque took seven years to build; when it was completed in 1653, Shahjahan travelled from Delhi by boat to offer prayers in this, the last of his architectural creations in Agra. Despite the elegance of Shahjahan’s additions, the fort pre-eminently expresses Akbar’s majestic sense of empire and the synthesis of the new nationhood he sought to create. For sheer presence, the great red fort of Akbarabad is one of India’s greatest.